A great weekend of Junior Tennis with two new winners! 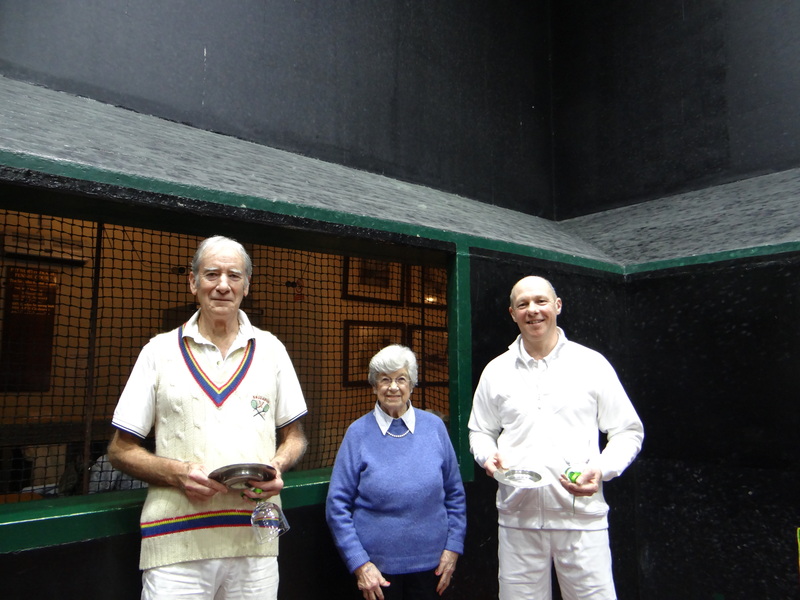 Saturday 2nd April – George Cooke Racquet – We had two groups playing in this handicap event and there was some fine tennis on show by all players competing. Monty was looking to win the title for a third consecutive year but could not find his form and did not quite make it through the group stage. 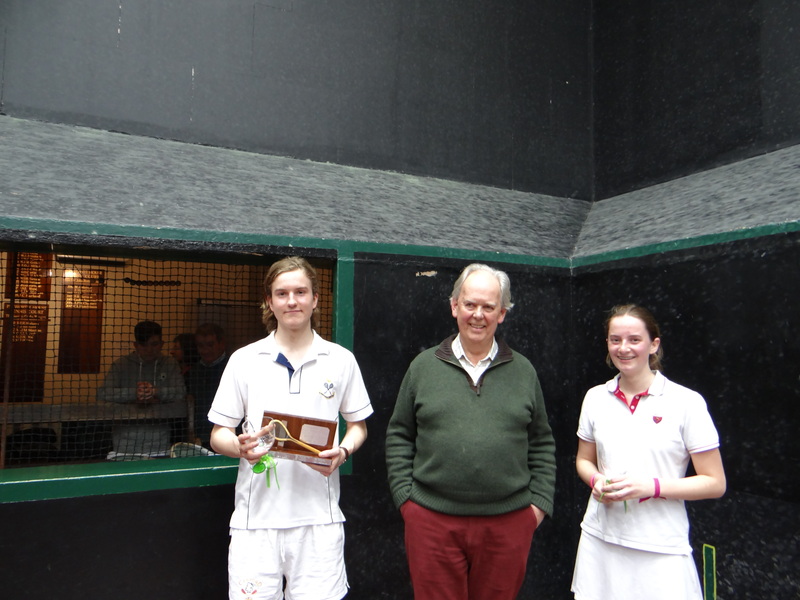 Isabella stormed through the first group winning all four matches and Sebastian sneaked through in second place with three wins and one loss (to Isabella). In the afternoon group it was Hugo who played some outstanding tennis to win all three matches and Theo who just got through as runner up on a head to head count back! In both the Semi-Finals there was a 26 point difference in handicap which equates to rec 30, owe 15 and one serve, ban tambour! Theo put up a good fight against Isabella but lost out 6/2 and Sebastian was just too strong against Hugo winning through 6/0. So a re-match of the group match and Sebastian was out for revenge against Isabella! The final started off very tight with both players looking a little nervous, but as time went on it was Sebastian who started to find his groove with some outstanding serving and retrieving and went on to win by 8 games to 2. Sunday 3rd April – Page Cup – With the five time winner Charlie Braham absent this year it was a real chance for our 6 players to get their hands on the Cup! Once again we had two groups playing for two places in the final. In the first group the top seed Oscar Wright won both of his matches comfortably to go straight through. In the second group Hugo Hodgson (the 2nd seed) started off a little nervous but played very steadily to also come through comfortably. 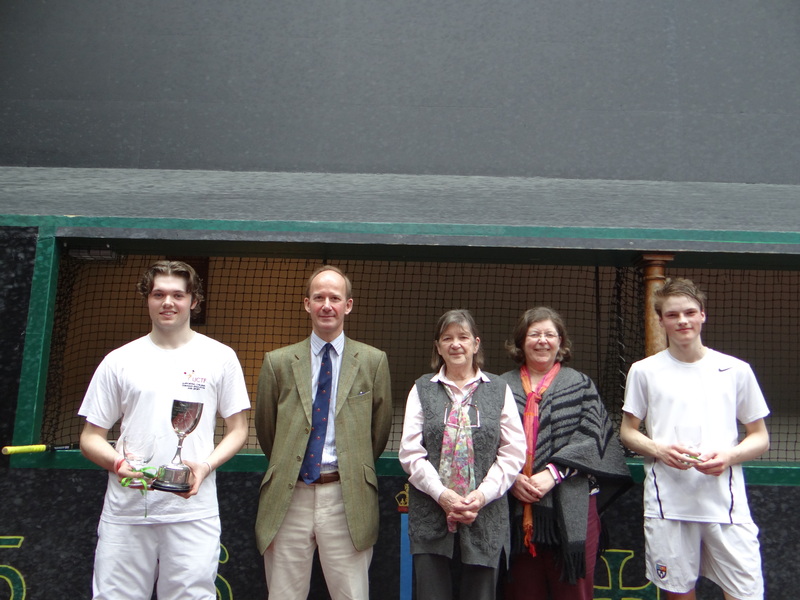 After everyone enjoyed a great lunch Oscar and Hugo took to the court for what was to be a great game of tennis. The first set was nip and tuck all the way to 4 games all and then Oscar just edged a couple of tight games to take the set 6/4. He then raced through to a 5/1 40/0 lead in the second set but Hugo was not quite finished yet! He saved 5 match points to win that game and then got all the way back to 4/5 when Oscar managed to steady himself and close out for a 6/4 6/4 victory. I would like to congratulate both players on some lovely tennis played in great spirit. Our thanks to Carole Muir for first class lunches on both days, to Philip Robinson for presenting the George Cooke on Saturday, to the Page family for supporting both days and presenting the Page Cup on Sunday and to family members and club members that were able to come along to support these events. This weekend the Petworth team travelled to Newcastle to take on Jesmond Dene in the semi-final of the Field Trophy. A two-hour practice session took place on Saturday afternoon before the match got underway at 10am on Sunday morning. In the first match our No. 1 singles player, Adam Dolman, played Charlie Harries-Jones. Adam was immediately under pressure from an in-form opponent but played steady and consistent tennis to take the first set 6-3. Charlie was fit and resilient and a very tight second set went to 5-5. Adam held his nerve and took his chances to win a most entertaining match. Charles Fuente and Bill Chambers then played their second doubles match against seasoned campaigners John Duns and Alan Douglas. Charles’ consistency from the back of the court, and Bill’s volleying from the galleries, gave them the ascendancy and, despite a series of close and hard-fought games, they ultimately ran out the winners 6-1, 6-0. Next Nick Harris at 3rd singles took on the rapidly improving 17yr old Alex Dyter. The first set was close and both players had chances to move ahead. Ultimately Nick’s experience at critical moments earned him the set 6-4 before his increasingly confident play took him on to win the second 6-1. Charlie Braham then faced Charlie Harris in the 2nd singles match. Whilst his opponent put up a spirited fight with a fierce two-handed backhand, again Petworth consistency gave us a close first set 6-4 and then the gap opened with a 6-1 margin in the second. Finally our first doubles pair, Andrew Page and Steve Calder-Smith, took to the court against Richard MacAlister and Ronald Paterson. Andrew was rewarded by the cut he was able to put on the ball and dominated from the back of the court whilst Steve put away some memorable volleys into the bottom of the tambour before they ran out the 6-1, 6-1 winners. Our hosts were supremely hospitable in providing refreshment throughout the day and a most excellent lunch. The court was a delight to play on rewarding both the railroad serve and cut on the floor. The team was nobly supported by Philip and Lyn Robinson, and Robert and Lesley Dolman, who travelled to Newcastle to support. It was an excellent result but the team must now prepare for the final on Sunday 13th March at Moreton Morrell against Prested Hall. If you get the chance to play at Jesmond Dene take it – you will have a wonderful time.